Achilles is a common overuse injury that occurs in people of all fitness levels. The causes can be variable, but one factor that seems to be consistent with all cases is stress to the gastroc and soleus muscles in the calf region with irritation and loading at the tendon insertion at the heel bone. This stress may be a result of continued forces placed through the tendon structure from activities ranging from standing, walking, exercise, to recreational activity or sport. The athlete with overuse tendinopathy not ices a gradual development of symptoms and typically complains of pain and morning stiffness after increasing activity level. Pain diminishes with walking about or applying heat (e.g. a hot shower). In most cases, pain diminishes during training, only to recur several hours afterwards. The onset of pain is usually more sudden in a partial tear of the Achilles tendon. In this uncommon condition, pain may be more disabling in the short term. As the histological abnormality in a partial tear and in overuse tendinopathy are identical. We do not emphasize the distinction other than to suggest that time to recovery may be longer in cases of partial tear. A history of a sudden, severe pain in the Achilles region with marked disability suggests a complete rupture. It is important to distinguish between midportion and insertional Achilles tendinopathy as they differ in their prognosis and response to treatment. We briefly review the pathology of Achilles tendinopathy, list expert opinion of the factors that pre dispose to injury, and summarize the clinical features of the condition. The subsequent section details the treatment of midportion tendinopathy. Archillies tendinopathy Level 2 evidence -based treatments for Achilles tendinopathy include heel-drop exercises, nitric oxide donor therapy (glyceryl trinitrate [GTN] patches), sclerosing injections and micro current therapy (see below), In addition, experienced clinicians begin conservative treatment by identifying and correcting possible etiological factors. This may include relative rest, orthotic treatment (heel lift, change of shoes, corrections of malalignment) and stretching of tight muscles. Whether these ‘commonsense’ interventions contribute to outcome is unlikely to be tested. The sequence of management options may need to vary in special cases such as the elite athlete, the person with acute tendon pain unable to fully bear weight, or the elderly patient who may be unable to complete the heel-drops. As always, the clinician should respond to individual patient needs and modify the sequence appropriately. These three ‘diagnoses’ are discussed together as they are intimately related in pathogenesis and clinical presentation. 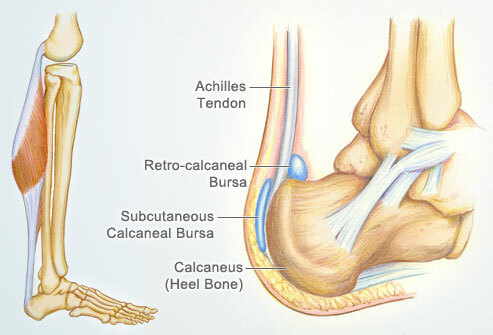 The Achilles tendon insertion, the fibro cartilaginous walls of the retrocalcaneal bursa that extend into the tendon and the adjacent calcaneum form an ‘enthesis organ’. The key concept is at this site the tendon insertion, the bursa and the bone are so intimately related that a prominence of the calcaneum will greatly predispose to mechanical irritation of the burs a and the tendon. Also, there is significant strain on the tendon insertion on the posterior aspect of the tendon. This then leads to a change in the nature of those tissues, consistent with the biological process of mechanotransduction. Treatment must consider the enthesis organ as a unit, isolated treatment of insertional Tendinopathy is generally unsuccessful. For example, Alfredson’s pain, full heel-drop protocol (very effective in midportion, tendinopathy) only achieved good clinical results in approximately 30%ofcases of insertional tendinopathy. Patients with more than two years of chronic insertional tendinopathy, sclerosing of local neo vessels with polidocanol cured eight patients at eight -month follow-up. Achilles bursitis is generally caused by excessive friction, such as by heel tabs, or by wearing shoes that are too tight or too large. Various types of rather stiff boots (e.g. in skating, cricket bowling) can cause such friction, and the pressure can often be relieved by using a punch to widen the heel of the boot and providing ‘donut’ protection to the area of bursitis as it resolves. Referred pain to this region from the lumbar spine or associated neural structures is unusual and always warrants consideration in challenging cases. Acute tendon rupture is most common among men aged 30- 50 years (mean age, 40 years); it causes sudden severe disability. Overuse Achilles tendon injuries-tendinopathy may arise with increased training volume or intensity but may also arise insidiously. Because the prognosis for midportion Achilles tendinopathy is much better than for insertion tendinopathy, these conditions should be distinguished clinically. Most textbooks suggest that rupturelim its active plantar flexion of the affected leg- but beware, the patient can often plantarflex using an intact plantar is and the long toe flexors. The condition that was previously called ‘Achilles tendinitis’ is not truly an inflammatory condition and, thus, should be referred to as ‘Achilles tendinopathy” pathology that underlies the common tendinopathy. Our elbow joint is made up of bone, cartilage, ligaments and fluid. 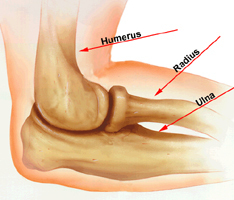 Muscles and tendons help the elbow joint move. When any of these structures is hurt or diseased, you have elbow problems.Our elbow joint is made up of bone, cartilage, ligaments and fluid. Muscles and tendons help the elbow joint move. When any of these structures is hurt or diseased, you have elbow problems. Fractures of the proximal ends of the radius and ulna. Supracondylar fracture of the humerus is one of the most common fractures in the children, and occurs in the age group of 3-13 years. This fracture is caused by a fall on the outstretched hand. Extension type: In this type the distal fragment is displaced posteriorly.This is the most common type and discussed here. Since the fracture line is above the condyles, and the whole of the distal end of humerus carrying the elbow joint is displaced backwards, normal three bony point relationships is maintained. When presented late, gross, tense swelling sets in which fills up the hollows around the elbow and obscures the bony landmarks. Sometimes even blisters develop over the elbow. In such a situation the fracture signs cannot be elicited. At the time of injury the distal fragment is displaced posteriorly there by pulling the brachial artery and the median nerve against the sharp distal end of the proximal fragment. This may cause injury to the brachial artery and/or the median nerve. It is therefore important to feel the radial pulse and test the nerve functions at the time of initial examination and make a record of it. Anteroposterior (AP) and lateral view radiographs of the elbow are essential. The AP view shows the fracture line which runs transversely just above the condyles. The distal fragment is displaced and rotated. The lateral view shows the posterior displacement of the distal fragment. Closed reduction: The fracture is reduced by closed manipulation under general anesthesia. The reduction is obtained by gentle traction to the forearm, manual manipulation of the fragments to align them properly, and then flexing elbow a little beyond 90°. If the radial pulse becomes feeble or disappears during flexion of the elbow, then the elbow is extended gradually till the pulse reappears. The fracture is then immobilized with the elbow in the same position. The fracture may be stabilized by passing. K-wire percutaneously. The extension type of the fracture is immobilized in an above-elbow PoP slab with the elbow in flexion, whereas the flexion type (less common) of the fracture is immobilized with the elbow in extension. In either case, the plaster is removed after 3 weeks. Traction: The cases which report late (more than one week) with marked swelling and blisters etc. are treated by continuous (Dunlop) traction for 3 weeks. There is an associated nerve palsy which needs exploration. These complications occur at the time of injury immediately after. 1. Injury to the brachial artery: This is the most dreaded complication; the brachial artery is injured by the sharp edge of the proximal fragment. The artery may actually be lacerated, thrombosed or may just go into spasm. The blood supply to the flexor muscles of the forearm may be affected resulting into Volkmann’s ischaemia. This requires immediate treatment. Volkmann’s ischemia: Injury to the brachial artery leads to impairment of circulation to the forearm and hand. There occurs ischemia of the deeper muscles of the flexor compartment of the forearm, such as flexor pollicis longus and flexor digitorum profundus. The muscle ischemia, in turn, leads to compartment syndrome. There is severe pain in the flexor aspect of the forearm when the fingers are passively extended. This is the most important test and is pathognomonic of muscle ischaemia. Treatment: The case of Volkmann’s ischaemia must be handled as an absolute emergency because changes may soon become irreversible. Remove tight bandage/splints/plasters etc. immediately. The forearm is elevated and hot bottles are applied to the other three limbs to promote general vasodilation. If no improvement occurs within 2 hours, the operation of fasciotomy is undertaken, if the flexor compartment is tight. In this operation an incision is made from skin down to the deep fascia to decompress the compartment. If the injury to the brachial artery is established by angiography/Doppler, exploration of the brachial artery is undertaken. 2. Injury to the nerves: Median, radial and ulnar nerves may be injured, in that order. In majority of the cases the nerve palsy recovers spontaneously. Malunion: Malunion is the most common complication of supracondylar fracture of the humerus and results in a cubitus varus deformity. This deformity occurs if the fracture has been allowed to unite with appreciable medial and internal rotation of the distal fragment. Treatment: If the deformity is unacceptable cosmetically, a corrective osteotomy in the supracondylar area is performed (French osteotomy). Myositis ossificans: Myositis ossificans is ectopic new bone formation around the elbow. This is a common complication which occurs following massage to the elbow after the injury and results in stiffness of the elbow. Treatment: In the acute painful stage, the elbow is immobilized in an above-elbow plaster slab for about 3 weeks. Otherwise, the main treatment is mobilization of the elbow, despite some pain. Volkmann’s ischaemia contracture (VIC): Volkmann’s ischaemia, if not treated in time, gradually progresses to Volkmann’s ischaemia contracture. The ischemic muscles are gradually replaced by fibrous tissue, which contracts and draws the wrist and fingers into flexion. If the peripheral nerves are also damaged by ischaemia, there will be sensory and motor paralysis in the forearm and hand. Diagnosis: There is marked atrophy of the forearm muscles. There is the characteristic deformity of flexion of the wrist and fingers. Volkmann’s sign: This sign is characteristic of VIC where the fingers cannot be fully extended passively with the wrist extended: but when the wrist flexed, the fingers can be fully extended passively. This happens because the shortened/contracted flexor muscle-tendon units do not permit full extension of the fingers and wrist simultaneously. Treatment: In established cases to normal is impossible because irreversible damage has occurred to the import and nerves. However, reconstructive surgery can only improve some function of the hand. (ii) Turnbuckle splint which gradually stretches the contracted muscles. Moderate cases require a muscle slide surgical operation where the flexor group of the muscles is released from their origin from the medial epicondyle of the humerus and ulna. Severe cases can be treated by shortening of the forearm bones, proximal row carpectomy and wrist arthrodesis etc. Even after the fracture has healed, full motion of the elbow may not be possible. In most of these cases, the patient cannot fully straighten his or her arm. Typically, loss of a few degrees of straightening will not have an impact on how well the arm will work in the future, including for sports or heavy labor. So treat your problem of Elbow Injury with Physical Therapy. Physical Therapy is the best treatment for the Elbow Injury.